The epitome of opulence, this former hotel once hosted such important figures as Franklin D. Roosevelt, Charles Lindbergh and Harry S. Truman. The hotel was built in stages from 1923 to 1929 and officially opened in 1925. It was quickly embraced by the public, then Charleston-dancing flappers and their slick-haired escorts. Celebrities like silent movie stars Lew Cody and Mabel Norman, opera singer Mary Garden, and actress Ilka Chase chose the Coronado for their St. Louis stays. The Coronado Hotel prices in the 1920s ran $2.50 for Room + Showerbath, $3.50+ for Room + Tub bath with Shower, and $5.00+ for a Double room. But the good life was not destined to last forever and in a moment of ignominy, the venerable Coronado Hotel was sold at a foreclosure auction on the steps of the Civil Courts Building in 1964. The city building commissioner attached a condemned sign to the building and padlocked the door in the interest of safety. After sitting vacant for about 15 years, $40 million was spent in 2001 to restore the building to its former grandeur. The rubble was cleared, the roof rebuilt and the original terrazzo floor uncovered and refinished, and the now iconic 45 art deco up-lights on the ballroom floor have been repaired. In addition, the Coronado housed restaurants, office space and 165 apartments. At the grand re-opening, about 900 guests filled the 10,000 square foot ballroom, including a balcony level, and marveled at the restoration. In early 2015, an additional $300,000 was put into a refresh of the Grand Lobby, East Lounge, Bradshaw Room, South Ballroom and Grand Ballroom. 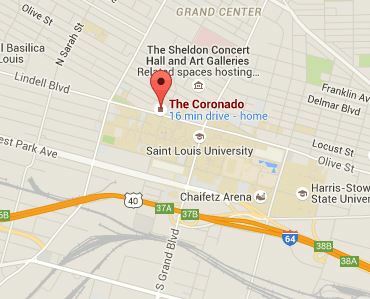 This venue is now bright, elegant, grand and extraordinary – a true gem in the St. Louis event scene. The classic yet updated spaces appeal to all. It is truly a St. Louis icon and an absolute must-see.